Much of the action in Moonraker takes place in the county of Kent, around the town of Dover, in the South-East corner of England. Sir Hugo Drax’s rocket base on is on the edge of the cliffs between Dover and Deal. The cliffs of course, are the famous White Cliffs of Dover. During their afternoon together, James Bond and Gala Brand head down to the bottom of cliffs. To their left the carpet of green turf, bright with small wildflowers, sloped gradually down to the long pebble beaches of Walmer and Deal, which curved off towards Sandwich and the Bay. They walked along in Silence until they came to the two-mile stretch of shingle that runs at low tide beneath the towering white cliffs of St. Margaret’s Bay. While there, a cliff face falls on them. It is worth noting that at the time in which he wrote Moonraker Ian Fleming owned a house at the end of St Margaret’s Bay called White Cliffs. Thus, he was intimately familiar with all the locales described in the story. Here is a very cool post with some additional photos and information. Sorry to say that the beautiful first image in this article is the Seven Sisters in Sussex, roughly 75 miles from Dover in Kent. 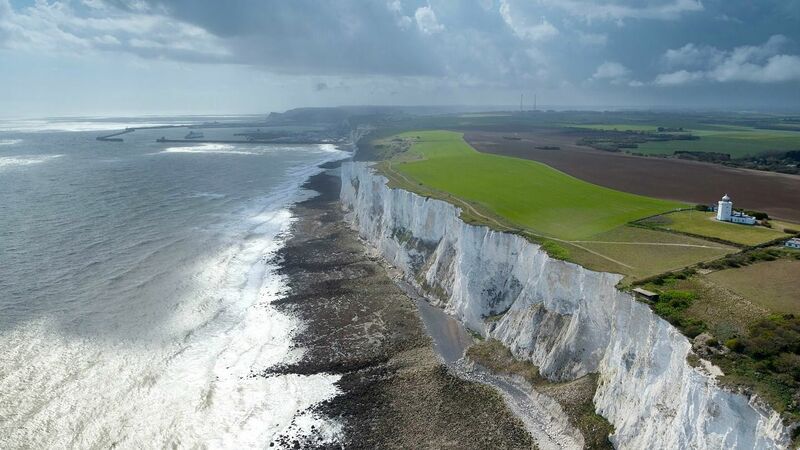 Stunning and often misused to represent the famous White Cliffs.